As I start to pack up my studio in preparation for our upcoming house move, I thought it might be fun to do the occasional post on random comics I come across as I pack; comics that have a story attached to them. So let’s start with the one that literally changed my life. Published by Marvel Comics in March 1982. 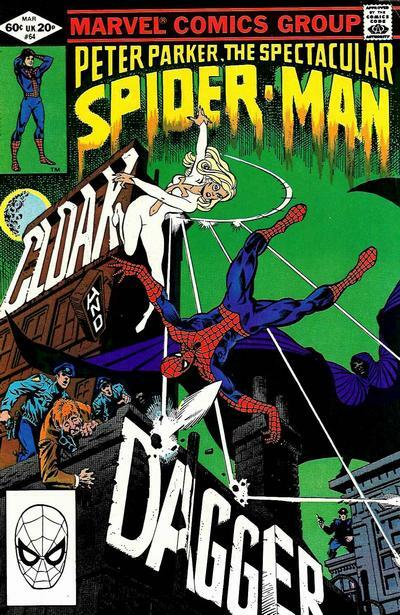 “Cloak & Dagger” written by Bill Mantlo, Pencils by Ed Hannigan, and Inks by Al Milgrom (although erroneously credited to Jim Mooney). One evening at college the alcohol fueled conversation turned to childhood heroes. I naturally rattled off a string of American super-heroes whose adventures I’d enjoyed over the years (although I had of course “grown up” and stopped reading comics on a regular basis when I was about fourteen – silly me.) Among the list of names I rattled off was a certain wall-crawler. Ah, who knew what that slip of the tongue would lead too? Oh boy – I was hooked from the moment I started to read. This wasn’t the cheap laugh I was expecting, instead I found a powerful story about runaway teenagers kidnapped by the mob and used as guinea-pigs for a new drug; who then turn on their captors as vengeful agents of justice. This wasn’t like any comic I’d read as a kid. I too had discovered a new drug, one that had four-colors and came on newsprint. And 31 years later I’m still hooked to what I rediscovered that day – the unparalleled power of sequential art story-telling.